X-rays provide a powerful and privileged vision beyond human eyesight. Nick Veasey, a British commercial and fine art radiographer, argues that the surfaces of things are superficial. They come and go with age, fashion, and style. Surfaces, then, contribute to object obsolescence. The worlds inside of objects, which hold information about the labor, materials, and assembly, are overlooked for newer things that are faster, easier to use, cheaper to assemble, and more trendy in appearance. Our response to obsolescence is often automatic: we discard what the free market deems unviable and old-fashioned. For X-RA*DI*ANCE, Veasey directs our attention to the inner worlds of forgotten objects—accentuating their craftsmanship and multi-faceted structure. His images of objects also have a deliberate surveillance aesthetic. 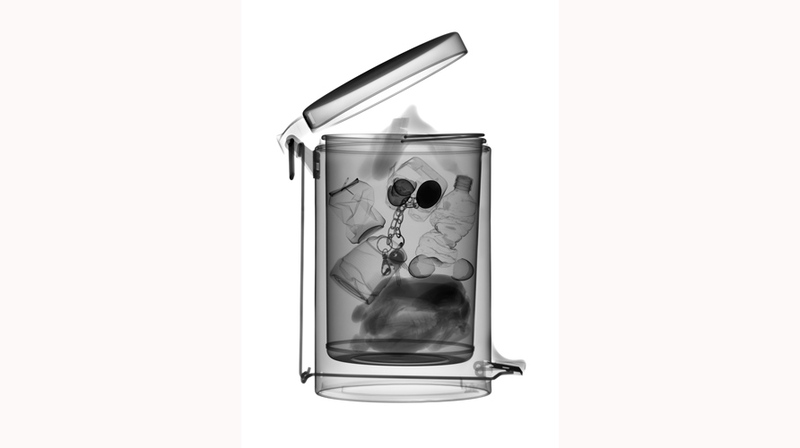 Using some of the similar gadgetry at airport security screenings, his exploration of materials is accomplished not with a sinister x-ray gaze, but rather with a scrutiny that brings out the beautiful anatomies of things. By harnessing the technology that surveys what is unknown to the naked eye, Veasey reintroduces us to the material object. To make these images, Veasey has a sophisticated x-ray facility on a former military base in Kent, England. He has lined the walls and floors of a large building with industrial strength lead that guard against radiation. When he makes x-ray pictures of objects, Veasey directs the technology from a nearby command center outside this large building. This process protects him radiation. For his x-ray pictures featuring human skeletons, Veasey positions special mannequins that radiology students use for practicing x-ray exposures. As a former radiography teacher, he also has access to deceased bodies donated to art and science—which he exposes to x-rays and then creates composite imagery on the computer. Veasey is best known for constructing an x-ray picture of a life-size Boeing 777 jet, commissioned by Boston’s Logan Airport in 2003. He has exhibited his work in art galleries international in scope and has presented a TED Talk entitled “Exposing the Invisible,” in which he narrates the complicated process of his work. He has received many photographic and design honors, including IPA Lucie Awards and a nomination for the IPA Lucie International Photographer of the Year in 2008. Veasey’s prints have been accepted into the Victoria and Albert Museum’s prestigious permanent collection.